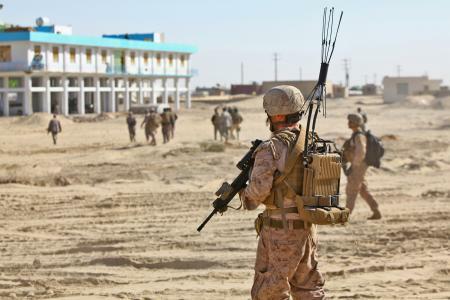 A Marine posts security for International Security Assistance Force coordinators and planners during a Dec. 2 site visit to Zaranj, Afghanistan. If you’re following the news about Afghanistan, you’re aware that key representatives from across the world are meeting this week in Bonn, Germany, to discuss what’s needed in the country’s future. Already, Afghanistan President Hamid Karzai has made headlines — and raised eyebrows — in Bonn by saying his country will need billions of dollars per year in U.S. financial assistance until at least 2024, 10 years after the expected 2014 departure of combat troops. In conjunction with the conference, an influential Washington think tank rolled out a new policy brief today — and its members are calling for an overhaul in how military commanders downrange operate. The U.S. military should “design and request a post-October 2012 force structure primarily focused on advising and enabling the ANSF [Afghan National Security Force] to replace U.S. combat units in counterinsurgency operations,” said the policy brief by the Center for a New American Security. The paper is by retired Army Lt. Gen. David Barno, Dr. Andrew Exum and Matthew Irvine, and posted online here. Perhaps most notably for service members, the paper suggests that the Marine Corps and Army reorganize to create specialized “advise and assist” units whose members specifically work alongside Afghan forces in Afghan-led missions. Too frequently, battalion commanders and other military officers have taken Afghan forces along on missions, but left them with few details in the planning process, Exum said today. While that’s easier and frequently more effective on a mission-to-mission basis, he said, it doesn’t ask enough of the Afghans and leaves questions whether they’ll be ready for primetime when the U.S. is gone. “If you give a commander a reason not to partner, he will take it,” said Exum, who led Army Ranger platoons in Iraq and Afghanistan. “There’s always a tactical reason” not to partner, he said. CNAS recommended not implementing any large-scale changes now because units who already have trained are either in the chute to deploy or already are downrange. They’ve prepared for the mission as they saw it, so switching gears significantly could cause more problems than it’s worth, the analysts said. The report is noteworthy because the White House has relied on CNAS to varying degrees in the past as it develops defense policy. Also of note: While the paper’s authors all believe the White House will stick with its announced plans to drawdown the force in Afghanistan by 2014, they doubted it will be to zero troops. Expect that an extended U.S. presence focused heavily on mentoring and partnering is likely, even if its a small fraction of the force currently deployed, they said. Correct me if I’m wrong, but aren’t the ANA people working with the marines supposed to be better trained and better performing than most of the regular army ANA troops? So what’s this guy talking about? KB, yes, that’s widely believed to be the truth. Exum made that point yesterday, too. The criticism and concern was focused more on the overall strategy. In particular, Marines are training ANA one way in the south while the Army, British and other forces trained them in other ways in different parts of the country. It was/is the same in Iraq. The Marine trained Sunni Brigades out of Al Anbar are the go to forces in Iraq. The same was true of the Force Recon trained Al Hilla SWAT. A Shi’ite SWAT that was a go to DA unit until the SF trained Iraqi CT units finally started to get it together a few years ago.